This is a post containing a few of my favourite e-Books related to travel and the lifestyle of travel. These books will hopefully come in handy if you also want to travel the world and work for yourself online, become location independent and be able to travel as much as you want. Just click on the links and you can buy these books online instantly, they are e-mailed directly to you. That’s the beauty of e-Books! 1. How to Make Money With Your Travel Blog!! This book does exactly what it says, it shows you how to make money with your travel blog, a totally fantastic read, very in depth and detailed and ultimately if you can put the effort and time into your travel blog then you will make money on it for sure! 2. How to Travel the World on 50 US Dollars a Day!! Yes you can travel the world for $50 US Dollars a day! As a rough average, Matt Kepnes has given a figure of $50 US a day to help you travel round the world. It’s easy if you follow his incredible tips and do it. The only extra advice I’d add is make sure you have a job while you travel, as that’s what I do. 3. How to Teach English Overseas!! Again Nomadic Matt comes up trumps with this perfect book on teaching English overseas. It’s a great insight into how to earn money all over the world. It surprised me how easy it is to teach English on your travels and this is a MUST BUY book if you intend to do so. Plus if you don’t like it you can get a full refund after 30 days! Can’t say fairer than that! How to teach English Overseas!! 4. Nomadic Matt’s World Travel Tips!! This a book which has some really excellent travel tips that you have never heard of! Buy it and see the world. 5. How to do Taiwan on the cheap!! It’s no secret how much I love Taiwan if you check out my extensive back catalogue of posts on it you will know that: Jonny Blair does Taiwan. It’s a cheap enough country as things stands but his e-Book allows you to see Taiwan for even cheaper. How to travel Taiwan on the cheap!! This book, written by Mike Delwiche is a story of love and travel and follows Andrew Mozart around South America – read about it here: The Liar’s Guide to South America and buy it here: Liar’s Guide to South America. Work on a cruise ship, save loads of money and see the world! That’s all there is to it – read this book and you will be able to work on a cruise ship, travel the world and live your travel dreams. Can’t recommend it enough! 9. The Ultimate Guide to Travel Hacking! Lisa and George from We Said Go Travel have released a cool travel memoir of their journeys, you can buy Traveling in Sin here or read my review. Traveling in Sin By George and Lisa Niver Rajna. I have written for quite a few books down the years including these ones. I’m interviewed in two pages in this book on the Green and White Army, Northern Ireland fans from 2008, written by Ivan Martin. I wrote an entire chapter on travelling to Belarus in this book from 2010, written by Shaun Schofield. Albania to America – with Belfast in Between by Shaun Schofield – I wrote one chapter on Belarus for this book back in 2010! 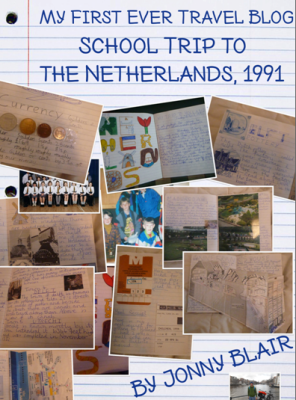 This e-Book contains the original hand written diary of my first ever travel blog from my trip to the Netherlands in 1991, the first time I travelled without my parents. 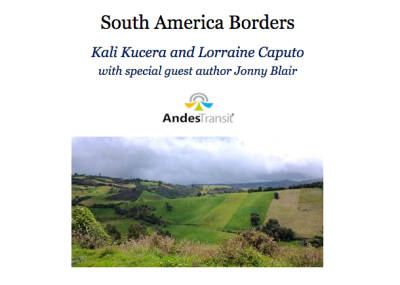 I contributed a few chapters and border crossings for this book on Crossing Borders in South America by Kali Kucera and Lorraine Caputo. 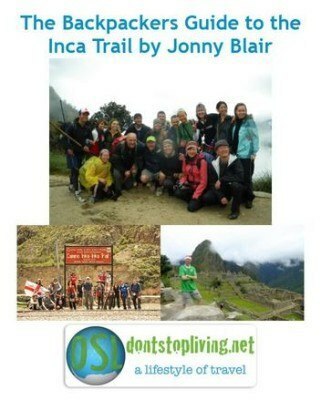 The Backpackers Guide to the Inca Trail is my guide to the Inca Trail. Back in 2010 I hiked the real Inca Trail in Peru and it was always my dream to release a book about it to help others interested in doing the popular hike. The book is a detailed 102 page guide to hiking the Inca Trail, with a full overview on how to get the most out of the hike as well as containing my entire diary from the four day hike! I’m excited that it is finally released. How to Monetize Your Blog!! Don’t Stop Living – a lifestyle of travel!